Flying Branch: Applicants who have completed Graduate in any with 60% of marks and have passed Maths and Physics at 10+2 level or equivalent from a recognized Institute for Indian Air Force Recruitment 2018. 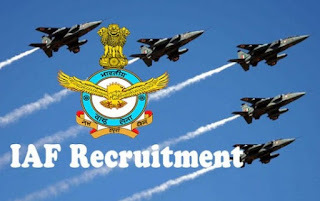 Ground Duty Technical Branch: Applicants who have completed graduation/integrated post graduation in Engineering/Technology and have passed Maths and Physics at 10+2 level or equivalent from a recognized Institute for Indian Air Force Recruitment 2018. Ground Duty Non-Technical Branch: Applicants who have completed Graduate in relevant with 60% of marks or equivalent from a recognized Institute for Indian Air Force Recruitment 2018.